On March 15th I got a wonderful handmade card for Mother's Day. 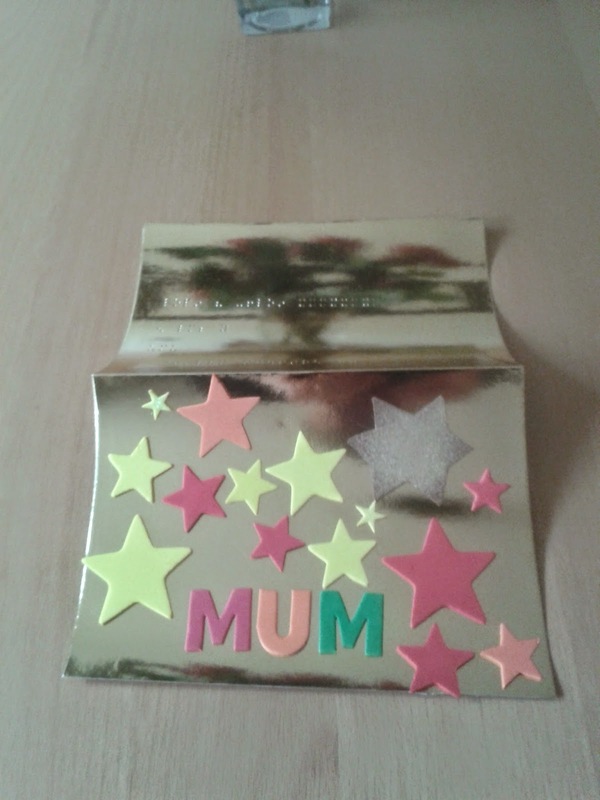 The card is shiny and gold and there is one word spelt out surrounded by stars, the word MUM. Becoming a Mum changed my life forever as it has done for women across the world, throughout history. As soon as that little blue line appears confirming you are carrying another life you alter. I changed my diet, I stopped drinking alcohol, I started ante natal classes and slowly I took on this new role. It wasn't just about me any more and I loved every minute of the feeling. Chloe was born at twenty to seven in the evening and I remember so vividly the joy I felt that she was finally here. My tiny, perfect little girl who her Dad and I could share our home, life and love with. That night I couldn't sleep I was so excited and overwhelmed by what I had just done. How many other women had lain on the same bed before me unable to do anything apart from stare at their brand new babies? Sometimes I catch myself staring at my now six year old daughter with that same sense of wonder. Every morning she climbs into bed, gives me an enormous wraparound cuddle, holds my head in her hands and tells me she loves me or giggles at something she remembers. I cannot measure the incredible joy she has brought us. Chloe, our unique deafblind child, teaches me about the world and I am incredibly proud every single moment of every day to be her Mum. I had no idea of the sadness that I would also carry, the fights I would have to have, the energy I would need to keep going or how I would take on a whole new role in order to survive. I proud to say I am a campaigning Mum. I am an activist on behalf of my child and other deafblind children who otherwise would be ignored and fall through the many cracks in our system. Our children deserve to be seen and heard, acknowledged and related to based on their communication needs. They should be able to live happy fulfilled lives as valued members of our community. My child is thriving thanks to the right early intervention and because I have been prepared to go into battle for her to get the specialist support she needs. Every day parents take up their own battles desperately hoping they will be heard in their bid to change the outcomes for their children. It can feel like we are ignored, overlooked or dismissed but we really do have rights as parents. Sometimes we just need the strength to speak up but that is not always easy to find. I haven't always been a talker. My own experiences of being disabled have not been positive and led me to shut myself away. As an adolescent. I lived with an overwhelming sense of shame and a feeling that I did not fit. What turned me into the fighter I am today was learning how to speak up and accept myself, wonky hips and all. At 19 I emerged from a prolonged period of mental illness having found my voice. I had no idea that twenty years later I would be using it to such good effect to argue on behalf of my child and the other deafblind children in Devon for services to be reinstated. On April 1st we get our key worker back, there will be more staff dedicated to supporting deafblind children and their families in Devon and section 7 assessments will once again be carried out. Thankfully newly identified deafblind children and their families will get the specialist support they so desperately need. The Rehabilitation Officers for Visually Impaired Children have also got the contract back to work in schools, ensuring all visually impaired children get independence and mobility training in the environment where they spend most of their day. Parents speaking up, coming together and campaigning using the Deafblind Guidance has enabled this change. Well done us. Being Chloe's Mum has taken me in a totally new direction. 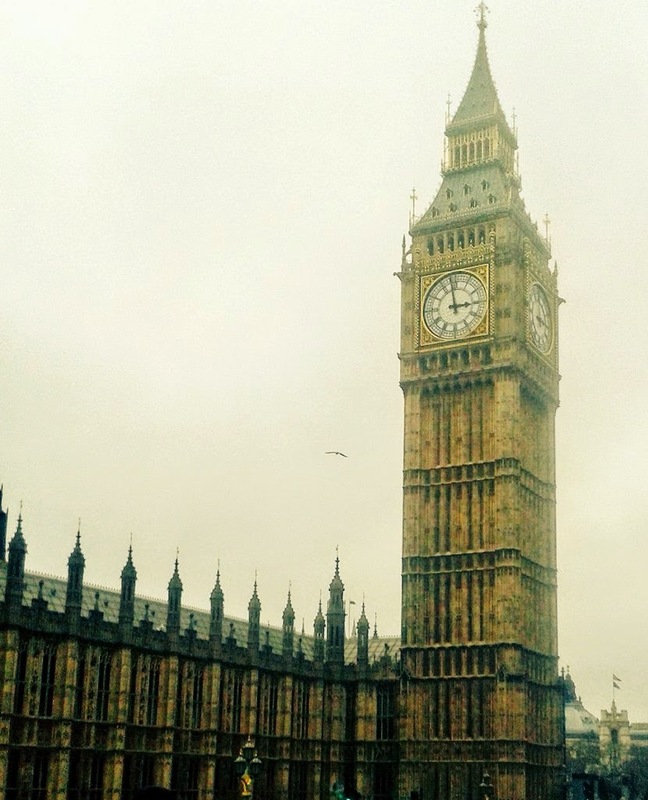 I have been to the Houses of Parliament recently in my role as a Sense activist to celebrate the reissuing of the Deafblind Guidance. 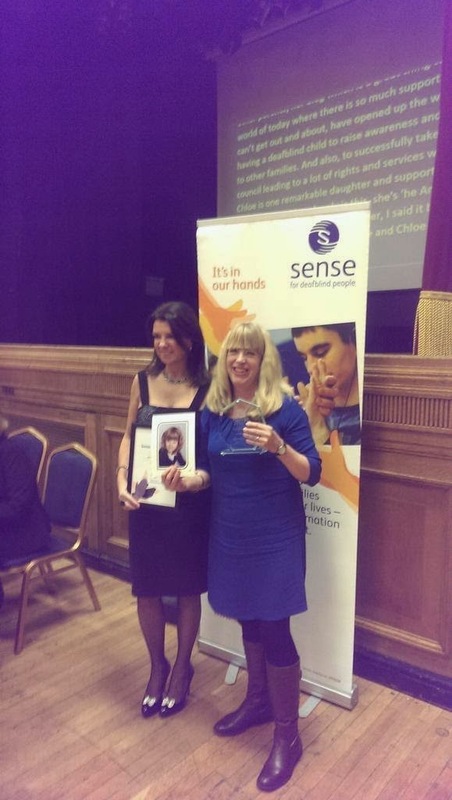 Chloe and I were awarded Sense Change Makers of the Year in December for the fundraising, awareness raising and campaigning we do on behalf of deafblind children and their families. The idea I had in my head of what being a Mummy would be like was totally wrong in so many ways. My child is a profoundly deaf, severely visually impaired little girl whose path ahead is not simple or straight forward. I will always be ready to knock down those barriers in front of her and give her the confidence to do the same. 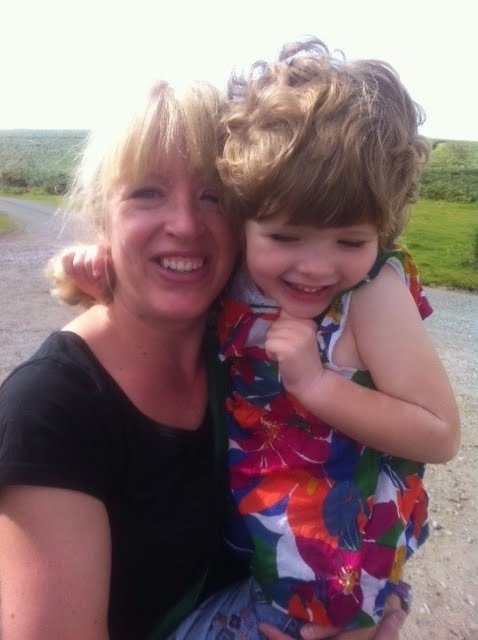 One thing that has always been certain is the love that we share and how lucky I am to be her Mum. This post is dedicated to all those amazing Mums and Dads who help steer a path for their children. Never give up hope that change is possible.